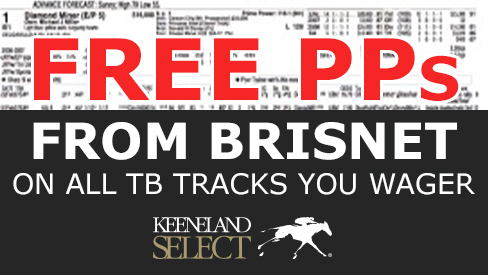 As a Keeneland Select member, you receive free Brisnet past performances (including international tracks), Insider Picks, and Power Plays on all Thoroughbred tracks you wager. Signing up for a Brisnet account is easy, and it will be directly linked to your Keeneland Select account. Brisnet information is located on the Handicapping page, or can be accessed here. Select the type of PP you would like that includes "*FREE for the tracks you wager." Brisnet will then ask for you to sign up for an account and include credit card information. Any Thoroughbred PP you download will not be charged to you as long as you make at least one wager on the card you downloaded. Many other Brisnet products are available, and the prices are noted on the right side. Please visit our support page for more FAQs on using the Brisnet PPs or contact Player Services at 1-855-533-2387.